We are using professional equipment which is checked regularly and the room is cleaned several times per day and every day. For hygienic reasons, we are asking our customers to use a towel on each bench. 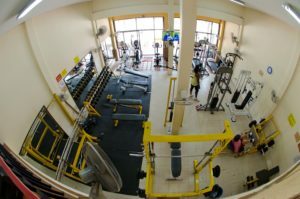 You can bring your own towel(s) or rent them at the gym, the price is 20 Baht per piece. We have a complete set of dumbbells, from 4 to 40 kilos, barbells, benches, press benches, …. but also treadmills, bikes, cross-trainers, all kind of equipment you need to start or to continue a training. And if you need advice, our staff is here to reply to your different questions. You can see the listing of our equipment on the Fitness and Workout pages.